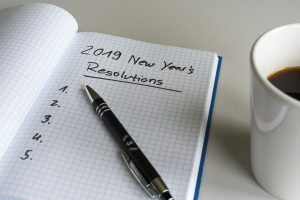 The New Year has arrived, and with it, an endless list of ways to make 2019 better than every year that comes before. But self-improvement isn’t the only way to achieve health and happiness. When you make your 2019 New Year’s resolutions, don’t forget these New Year’s resolutions for your home. Check air quality. With the cold, rainy weather Atlanta’s had all winter, chances are you’re spending more time than usual indoors. Are you breathing fresh air? Exposure to air contaminated with mold spores, lead dust, asbestos, or milder contaminates like pet dander can cause serious health issues. To improve indoor air quality this winter, clean regularly, change your air filters, and call a professional to examine any cracked paint or caulk for signs of lead contamination. Prevent mold buildup. Cranking up the heat may make your morning shower more appealing, but it also increases the humidity in your bathroom. To prevent mold from growing, run a fan during and after your shower to dissipate condensation. Squeegee any moisture from the walls and shower tiles, clean the tiles weekly, and seal any grout lines that tend to grow mold or mildew (after proper removal, of course). Plan home improvements carefully. New year, new home! We get it; you’re itching to kick off your next home renovation. But before you let those big plans get away from you, pencil “home safety” in the #1 spot on your to-do list. Home renovations can disturb mold, lead paint, and asbestos particles you don’t know are lurking in your home. Before starting any new projects, call a professional to assess for possible contaminants, especially if you live in a home built before 1978. Whatever home improvements you have planned for 2019, Clean Environmental Group is here to help. We’re experts in assessing and abating home contaminates like lead paint, asbestos, and mold. Call today and start the new year with a clean slate.